^ Vladimir and Estragon are not even sure what day it is. Throughout the play, experienced time is attenuated, fractured, or eerily non-existent. Contrarily, the character Pozzo, however, prominently wears and takes note of his watch. 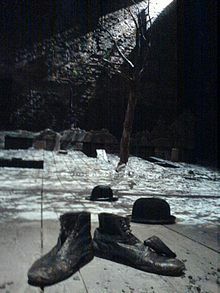 ^ Roger Blin, who acted in and directed the premier of Waiting for Godot, teasingly described Lucky to Jean Martin (who played him) as "a one-line part". ^ Itzkoff, Dave. The Only Certainty Is That He Won’t Show Up. New York Times. 12 November 2013 [12 November 2013]. ^ See Brown, V., Yesterday's Deformities: A Discussion of the Role of Memory and Discourse in the Plays of Samuel Beckett 互联网档案馆的存檔，存档日期2007-09-27., pp 35–75 for a detailed discussion of this. ^ 22.0 22.1 Gurnow, M., No Symbol Where None Intended: A Study of Symbolism and Allusion in Samuel Beckett's Waiting for Godot 互联网档案馆的存檔，存档日期2013-06-17.